The United States is big. Huge sections of it are quite flat. Entire states, even. On a road trip this summer, I had the pleasure of experiencing some of the not-flat portions of the country out west, and like any true geek I brought some tech with me along the way. As a result, I have this lovely elevation profile for my trip along I-80 from Madison, Wisconsin to San Jose, California. Some things to note: just 85 miles separate peaks in the Rockies at 7200 feet from sea level at the coast. 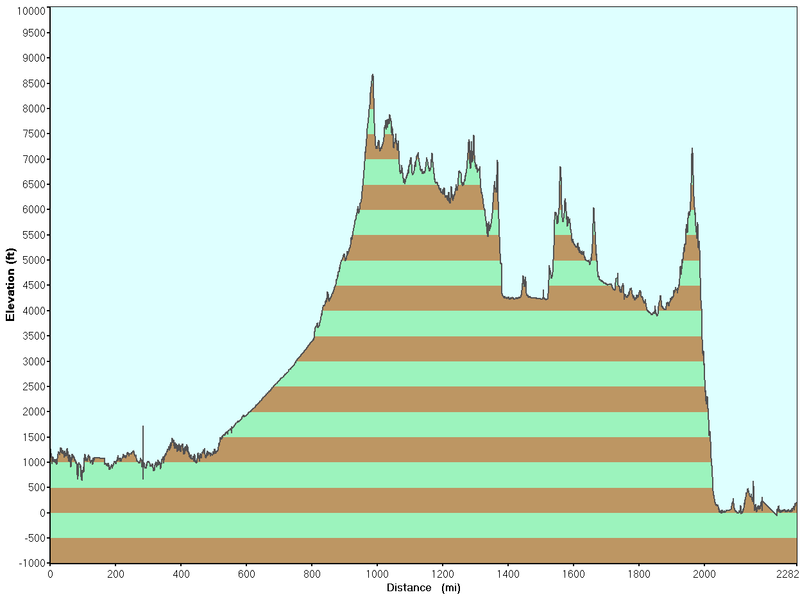 The steepest descent is on that dip right in the middle: 2000 feet down in just 10 miles, nearly a 4% grade. Followed by a radiator-testing ascent of nearly the same caliber. I was planning on experimenting with a rear-facing road trip movie (would this be nauseating? ), but my hard drive suffered a screeching head-crashing fiery death along the way, nuking all the photos. Ok, no actual fire, but there was a horrible noise followed by improvements to my backup regimen. Instead, you'll have to read about it on Brian's webpage about the same trip two weeks before. The (forward-facing) movie's at the bottom of the page.